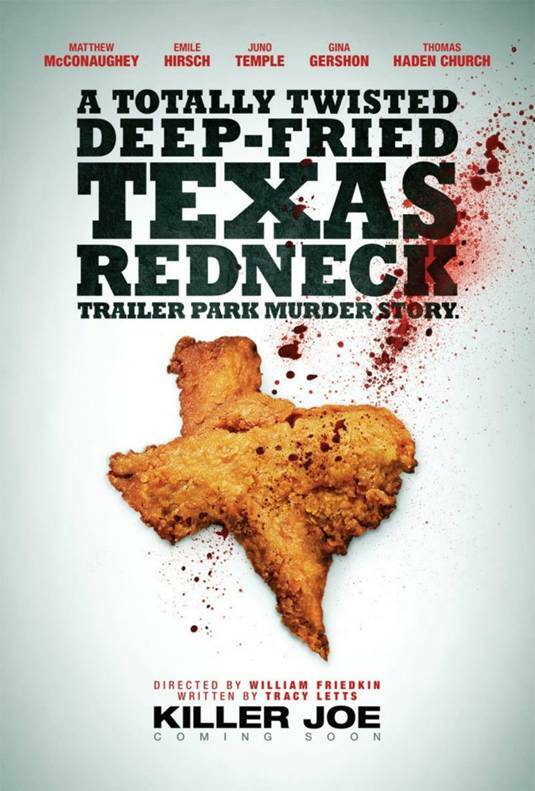 The Texas family we meet in KILLER JOE can best be described as a collection of white trash stereotypes. Chris (Emille Hirsch) is a dumb-as-a-bag-of-hammers drug dealer in trouble with his supplier, due to his no-good mother stealing his stash. Chris' sister Dottie (Juno Temple) is just as dumb and also a little bit “off”, probably due to brain damage suffered when mom tried to kill her as a baby. She's a virgin, but walks around half naked like she's starring in some 70's hicksploitation movie, and of course her brother has the hots for her. Dad Ansel (Thomas Hayden Church) appears even dumber than his kids, if that's possible. The smartest thing he ever did was to leave the mother of his children, but his current girlfriend Sharla (Gina Gershon) is no prize, either. To save himself from retaliation by his dealer, Chris decides to kill his mom and collect on her life insurance policy, with Ansel as his not particularly effective accomplice. Neither man is up to doing the deed himself, though, so they enlist the services of Joe (Matthew McConaughey), a Texas police officer who moonlights as a hitman. Joe normally only takes a job with the cash of front, but after meeting Dottie he agrees to take her as collateral until the insurance money comes in. The film is based on the first play by screenwriter Tracy Letts, whose previous collaboration with director William Friedkin resulted in the psychological thriller BUG, a personal favorite of this reviewer. KILLER JOE is a very different animal altogether. Letts appears to be going for pitch black comedy here, serving up plenty of deadpan twisted laughs on top of a gritty crime plot. That almost makes KILLER JOE sound like one of Joe R. Lansdale's Texas noirs, but while Lansdale doesn't shy away from showing the ugly side of the Lone Star State, he also shows its decency. Plus his jokes are a lot funnier. Friedkin and his cast all do excellent work, but the film is so relentlessly unpleasant and the characters so uniformly unlikeable that it's hard to care. It's just a long, pointless NC-17 redneck joke, and that's even before it gets to the sure to be notorious scene involving McConaughey, Gershon, and some fried chicken. One hates to throw labels around too casually, but if this scene isn't misogynistic, what is? When the film at last reaches its final, obvious punch-line, one has to wonder what's the point of it all beyond having a few yucks at the expense of easy targets. 2 1/2 out of 4 stars.